A Natural Horsemanship Training Kit. 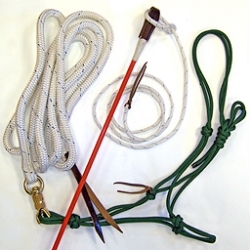 Containing a Rope Halter / 12ft Communication Training Line (Rope) / Stick and Universal String. Parelli Style Natural Horsemanship Training Kit is made from Soft High Quality Materials and is Ideal for Natural Horsemanship / Parelli Training. 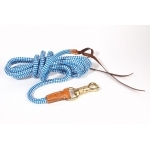 The 12ft Rope has a sturdy brass swivel snap clip that prevents the rope from twisting. The Natural Horsemanship Training Kit is easy to use and excellent value for money. Please see the descriptions of the individual items for more information or please contact Urban Horse - sales@urbanhorse.com for any other information - The Urban Horse Team is here to assist! Natural Horsemanship Training Kits - Made from the Finest Quality Materials but Affordable!